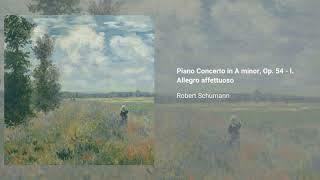 Robert Schumann completed his Piano Concerto in A minor, Op. 54 in 1845. 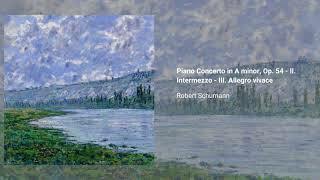 It was premired by Clara Schumann te following year, with an orchestra conducted by Ferdinand Hiller, the work's dedicatee. 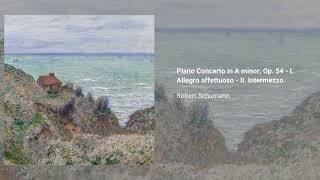 This work, which actually started as a Fantasie, was the only piano concert Schumman completed, as his previous attempts at the genre had been frustrated. Clara urged him to expand the Fantasie and he added to more movements, thus completing the work. 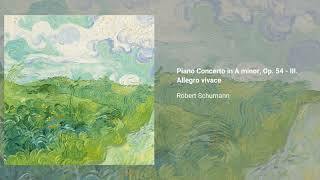 After this concerto, Schumann wrote two other pieces for piano and orchestra: the Introduction and Allegro Appassionato, Op. 92, and the Introduction and Allegro Concertante, Op. 134. The concerto is scored for 2 flutes, 2 oboes, 2 clarinets, 2 bassoons, 2 horns, 2 trumpets, timpani, strings, and a piano. The piece, as marked in the score, is in three movements, even though there is no break between the last two, and Schumman actually preferred that the movements be listed as only two in concert programs.